I'm no artist, but I've heard that knowing when to stop is one of the important aspects. Please excuse my poor trackball artwork, but something like the above. And you get to make some more of those fun reverses! You'll need to isolate the parts electrically so you don't make a battery. I kinda like the running boards. I agree with c William Rose that they should blend to the front fenders. I would probably also put a small radius up to a flange on the back of the board where it fastens to the rear fender. As for the strips if there is a good coat of paint between the stainless & mild steel should not be a problem. Could even use double side adhesive tape to fasten them, like the auto manufactures do. I think the front fenders should round underneath themselves, not sure how that would work or look. Leave the running boards off, just keep things simple. Looks good the way it is. Since the body lines are swoopy, how about swooping the running boards in the middle a little more than is shown in the mockup. Make them curve in, (maybe 2" + or- wide at the narrowest point). That will minimize them a little so they don't detract from the body, may even enhance the swoopy body lines. It would also deter people from using them as a running board step. Judging by the project so far, in the end I have not doubt it will turn out cool either way. Didn't some late 40's early fifties cars have a rolled body line at the bottom of the door that was ''just this close'' to looking like a running board? I've got mixed emotions about it also and obviously you guys are mixed as well. In this side view, you see the black area under the door. That will be a rocker panel that will come down ALMOST to the bottom of the frame. If I do running boards they would replace that rocker panel height wise so the thickness of the body would not change. The Panel Craft site has a magnificent slide show on the creation of a Delahaye in aluminum. WELL worth the time to watch. Some great, great knowledge buried in the photos. Pay special attention to the running board. I wouldn't attempt to do one as part of the fender like that though. I'd make it a separate piece. I'll mock it up when I get the car out in the light. I really need some new photos with the current work and the final wheels and tires. 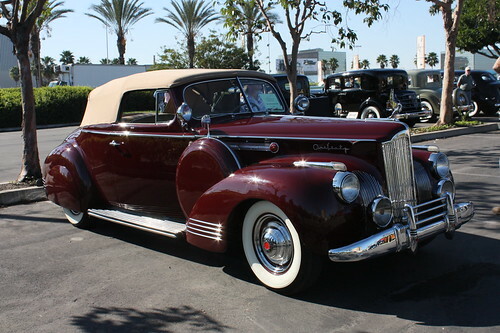 Packard offered cars with or with out running boards. If you chose no running boards you got rocker panels or frame covers. These are '41's. The bottom one I built in 1996-97. I made rocker panel covers that looked like similar to the ones Packard offered. On a side note the top was chopped 6" in the front and 11" in the back, suicide doors, frenched 52 merc headlights, 39 ford tail lights , 331 hemi with 2-4's, louvered hood. Last edited by keith; 03-02-2011 at 03:03 PM. Today was a GOOD day! Finished up phase 1 of a challenging customer project, put the roadster on the ground, and WENT FOR A DRIVE!!! It's a good thing the bugs aren't out yet or my teeth would be full of them. Boy that is the definition of motivation! I'd forgotten how much fun it is to drive. This is the first time I've driven the car with the new wheels and tires on it and it makes a big difference. The other tires rubbed at full turn and these are just a bit smaller. This is kind of a drivers eye view but I held the camera a bit high and it looks like you'd be looking through the windshield but when I hold it at actual eye level you're looking through the glass. My favorite view on the car. Tail lights are going to be a big help on the rear end. The tires look pretty good in the wheel openings. You may not have many miles on it, yet the roadster has been down a long road. Glad to see you'll be on the highway soon.